Prophets Without Honour is a collective biography set in an extraordinary epoch of cultural history sometimes called “the Weimar Renaissance.” In a series of mini-portraits, Grunfeld has written a tribute to the German-speaking scientists, musicians, writers and artists who created European cultural life in the early twentieth century. All were evicted or murdered by the Nazis. 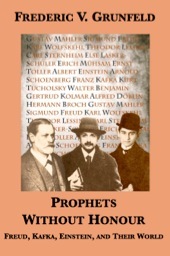 Albert Einstein, Walter Benjamin, Sigmund Freud, Gustav Mahler, and Franz Kafka are the best-known of his subjects but Grunfeld includes such lesser-known figures as Else Lasker-Schüler, Ernst Toller, Gertrud Kolmar, Alfred Döblin, Erich Mühsam, Carl Sternheim, Kurt Tucholsky and Hermann Broch. Grunfeld summarizes their lives, illuminates their work, traces their interactions, and sets it all against the background of Central European political and cultural life in the first three decades of the last century.